Nearly thirty years ago, I wrote a book, The Heritage of the Dog, with a final chapter entitled Do You Remember the British Dog'? The last line of this chapter read: "...but who is going to protect our native breeds of dog as human whim determines their demise'? They too are part of our heritage." In 2003, the Kennel Club undertook to identify and confirm those breeds of British dog which could be considered 'vulnerable' through declining numbers. Although the KC claims nowadays to speak for all dogs, the subsequent list of vulnerable British breeds only included breeds recognised by them. Their list comprised a dozen terrier breeds, seven gundog breeds, four hound breeds, three pastoral and two from the Toy breeds. The British public have great affection for such breeds, which embrace the Skye, Sealyham, Dandie Dinmont and Manchester Terriers, the Clumber, Field and Sussex Spaniels, the Cardigan Corgi and the English Toy Terrier. This is but a start on a most valuable campaign. But what about those native breeds of dog, which are just as vulnerable, but not recognised by the KC? Because a British breed is either not recognised or no longer recognised by them could mean it is even more vulnerable. Who is going, as I put it nearly thirty years ago, to protect them as human whim determines their demise'? Breeds of terrier favoured by those who work terriers range from the feisty Fell Terrier, the mainly black Patterdale Terrier and the Sporting Lucas Terrier. Others, more companion dogs such as the Lucas Terrier, maintain a loyal following. 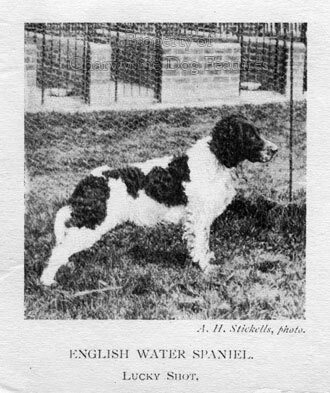 We have lost so many old British breeds, some like the English White Terrier, the Harrier and the English Water Spaniel were once recognised by the KC. Why did they not act to prevent their demise'? It took them a century to recognise Parson Russell's terrier but only a few years to recognise artificially-created foreign breeds, like the Cesky Terrier, the Eurasier and a specially-designed breed, the Russian Black Terrier. But there are more Plummer Terriers in Britain than these two breeds put together; why no moves to claim them even if only to list them as vulnerable or emergent'? We seem likely to lose the Smooth Fox Terrier in the next century - a sad loss of a breed once the most popular in Britain. Those involved in the world of hounds used for hunting need support if these precious packs are to be conserved. 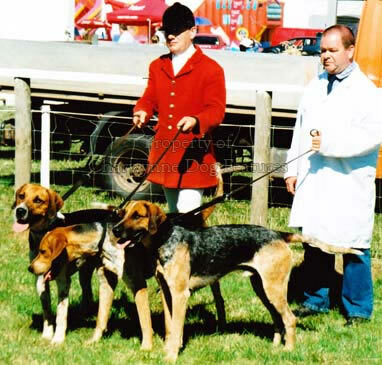 We have already lost the distinctive and highly efficient Dumfriesshire pack of black and tan Foxhounds. This alone represents a considerable loss of unique irreplaceable genes from the packhound pool. We need to give thought to the long-term future of our Harriers, Staghounds, English Bassets and that valuable breeding outsource: the Welsh Foxhound. No doubt the ever active Welsh Assembly has the latter firmly in its sights but sadly not with its conservation in mind. With the new emphasis on 'Britishness' perhaps the hunting dogs of Britain will receive some much-needed interest from the public. The public try to care about conservation but have long been badly informed by the popular press about hunting with hounds. 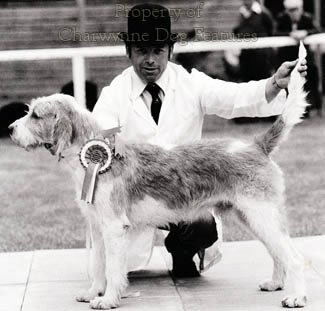 The Otterhound alone has reached the Kennel Club rings, one form of conservation. 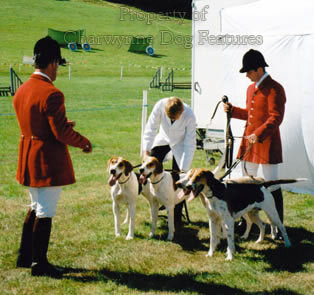 Those involved with the hounds of the packs dread their type moving into the show ring. The contemporary Bloodhound of the show rings indicates all too vividly what can happen to a 'design for function' when those only interested in appearance hold sway. Why favour a scenthound from Sweden, like the Hamiltonstovare, when we have superlative and very similar hounds here like the Studbook and West Country Harriers? 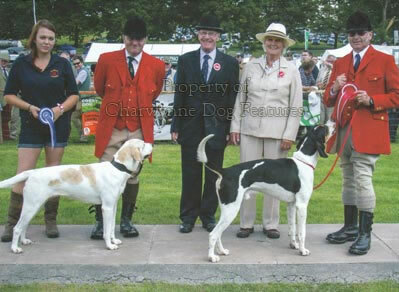 Why import a Grand Griffon Vendeen when we have the highly rated Welsh Foxhound available, of comparable type? Why, if you fancy the Basset Hound, not go for the delightful little scent hounds developed as the English or Hunting Basset? Or do you just want a canine caricature as a pet? What are the advantages of the Grand Bleu de Gascogne over our steadfast and long-proven Staghound? And have those now bringing in the Segugio Italiano ever seen a Trailhound in Cumbria, they really are something special. They race rather than hunt, they run freely rather than as a pack, but their genes are so valuable. They have Pointer blood in them; their breeders sought performance from superb hounds, not pure-blooded fading stock, losing virility, yet still bred in a closed gene pool for 'old times sake'! What must our neglected undervalued breeds of British dog think of us! They could be excused for thinking; 'you humans bred us almost ruthlessly, over two or more centuries, to be the most effective hunting dogs in the world only to change your mind about our use and despatch us from your plans. Thanks a lot!' Do we as a nation really not give a damn about our native breeds of dog, especially those not recognised by the KC? The Foxhound is now recognised by them; the Harrier once was, but no longer is. Shouldn't that be put right? Perhaps the best way of ensuring that there is a future for our distinguished varieties of sporting dog is for show and field enthusiasts to work together at the top level. The gundog breed clubs should for example be linked with the BASC. But it is the packhounds that we stand the chance of losing. And it is emerging native breeds, like the Plummer, Fell and Sporting Lucas Terriers, the Victorian, Sussex and Dorset Bulldogs and the Welsh Black Mastiff, which need perceptive patronage. If the KC truly claims to be representing all dogs, why isn't it striving to ensure the conservation of every British breed, whether recognised by them or not? When the Kennel Club was set up, it was largely the work of sportsmen. In every sporting breed making its way to the show scene at the end of the 19th century there were sportsmen, both aristocratic and artisan, involved. Now there is a huge gap; but there are lessons to be learned over perpetuating vulnerable breeds from experienced packhound breeders. Any breed with a closed gene pool, created from a small genetic base, could benefit from studying Foxhound breeding. The reason that these hounds are so effective, so sound physically and so virile is that 'racial fatigue' has never been allowed to creep in. Outcrosses to other packs, to French hounds, American hounds, Fell Hounds, Harriers and Welsh Foxhounds has recharged their batteries. And, it must be stressed, this has been achieved with no loss of type. Today's Foxhound looks just like its ancestors. Some of our native pedigree breeds on the vulnerable list don't look like theirs. I applaud all the worthy efforts being made to safeguard precious native breeds under threat from declining numbers. But if we save a number of valued pedigree KC-recognised breeds but lose others, merely because they are not on the KC register, that would be sad indeed. As the Hunting With Dogs Act takes its toll, as it surely will in some instances, we need to put in place measures to conserve our sporting breeds; these are the best bred, best physically-equipped and most robust dogs in Britain, we cannot just forget about them. Any British breed of dog, however recognised or registered, deserves our support. The emergent British breeds urgently need to be recognised.